Have you won something in the Game Time Gold at McDonald’s already? 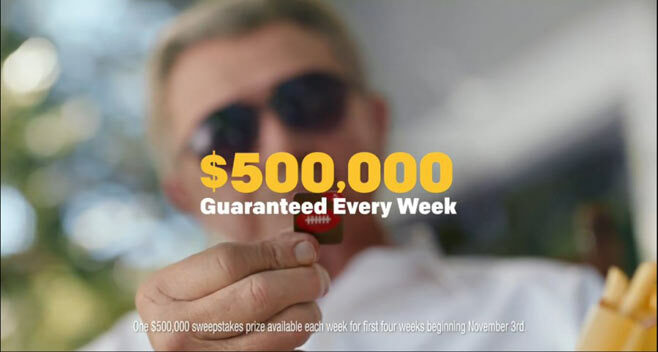 McDonald’s is giving NFL fans a chance at $500,000 in cash and trips to Super Bowl 50 each week in November! Now get ready for Week #2! Just like last week, just head to McDonald’s, peel the Game Time Gold Game Piece affixed to the packaging of select McDonald’s menu items such as McMuffin sandwiches, Biscuit sandwiches, Big Mac sandwich, Filet-O-Fish sandwich, Hash Browns, Large Fries and Medium Fountain Beverages and text in your Game Piece Code or enter it at playatmcd.com. You have until 11:59:59 p.m. ET on November 14, 2015 to enter Week #2 so visit your local McDonald’s restaurant today to get started. Good luck!